Hi everyone ! Arkos is proud to present you his new sountrakker on CPC, STARKOS 1.1. STarKos is a conventional soundchip tracker, in the sense that writing musics is done the same way as existing trackers on CPC or Atari ST. The new features mainly comes from sound editing. - Each position is composed of 3 tracks, one par channel. - Manages 512 tracks, each one being reusable several times in different positions OR in the same position, why not. Memory saving ! - A track can have a height from 0 to 127. - Each track can be be transposed independently. - The whole song can be transposed. - Each position has its own height, from 0 to 127, independently of the height of the tracks. - 255 instruments free to use. - Each PSG registers can be modified while creating instruments. - Each track/instrument is compacted in memory, this one is reorganized after every modification, so you've got plenty of memory for you ! - Frequency replay of 13, 25, 50, 100, 150 or 300 hz. - *** NEW ***. Now you can see the patterns scroll while playing the song ! - Digidrums are supported : it is possible to enter 'SPL' keys along with a sample number, that can be read through the external player while playing the song. However, you can't load/hear a sample inside the editor. After having typed RUN"STK", appears the STarKos main menu. 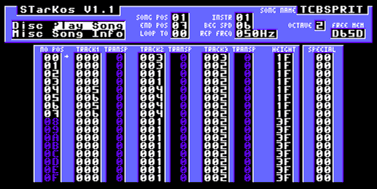 Most of the pages composing Starkos follows the same 3 parts design : a menu on top-left, some data on top-right, and the middle and bottom of the screen being taken by the song information. You can go from a part to another by pressing TAB, and ESC to come back to the first one. With the cursor keys, move this one, use SPACE or RETURN to select. Every number upon which you move can be modified, either by typing a new number (ESC to cancel), or by increasing/decreasing it through left/right combined with SHIFT and/or CONTROL. Each number possesses a min/max limit, and every of your entries is corrected according to this interval. Note that some numbers are signed, so you will have to use '-' if you want to enter a negative value by typing it. Finally, let's precise that all numbers use the hexadecimal notation, I won't insult you by explaining. - The TRACKS repesent the basis of your compositions. All the notes are entered there. Each track has a height from 0 to 127, and you've got 512 of them. Each track is identified by its number. - a PATTERN is composed of 3 tracks, each played on one channel of the PSG. It's impossible to play a track alone, it must be included to a pattern. You can use up to 256 patterns, each having a height from 0 to 127. If the tracks included are higher, then they'll be truncated INSIDE THIS PATTERN ONLY, which means that the 'overflown' data aren't erased from the memory at all, they're not used in this pattern, that's all. So it's possible to use half of a track in a pattern, and the whole in another. On the opposite, a pattern can be higher than the tracks inside. In this case, there's no problem, you'll find empty notes at the end of the tracks. Note that it's possible to use the same track 2 or 3 times in the same pattern. The fact that the tracks are independent of the patterns allows a lot of memory saving. I encourage you to use a track as much as you can along your song. allowed, but your songs will be really shorter than that usually. The Position system allows the musicien to play the same pattern several times without having to copy it. - You know or guess what INSTRUMENTS are, so I won't dwell on that. You have 255 instruments, from 1 to 256. - SPECIAL TRACKS are new. They allow to set digidrums, and speed changes. Each pattern has a Special Track, on top of the 3 normal tracks. You have 256 special tracks available. This screen allows to link the tracks of your songs. Press TAB to go in the middle part of the screen, and use up/down with SHIFT and/or CONTROL to move quickly. NOPOS : Positions number. The position 0 is the first one played of your song. TRACK1/2/3 : Tells which track is played in this position, and on which sound channel. TRANSP1/2/3 : Tells the level of transposition attributed to the track of each channel. In most case, it equals 0. HEIGHT : Height of the pattern, from 0 to &7f, thus a height of 1 to 128 lines. SPECIAL TRACK : Number of the special track used for this position. As you've probably notice, some NOPOS are white, others blue. Know that only white POS are going to be played, because only them are included to the interval of the played positions, from 0 to ENDPOS. To modify this value, 2 ways : Press TAB till you're in the upper right part and modify the value. You can also use the keyboard shortcuts in the middle part : RETURN to define ENDPOS, SPACE to define LOOPTO, according to the cursor position, obviously. Note as well that each move refreshes NOWPOS. Moreover, know that LOOPTO is always equal or inferior to ENDPOS, which is logical. SONG POS = Current position. It's the pattern linked to this position that's going to be edited (when going to the pattern editor). It's also from here that will be played the song if you select 'PLAY SONG'. END POS = Last position used in the song. Defines the end of the song, in other words. LOOPTO = When the music is over, it loops to the position designed by LOOPTO. Generally, LOOPTO=0 to make the song restart from the beginning. INSTR = Number of the current instrument. You can play this instrument (see below), and it's this one that will be written inside the tracks when editing patterns. OF course, you can change it at any time. BEG SPD = Speed of the song when played from the beginnning through PLAY SONG. REP FRQ = Replay Frequency. Various possibilities : 13, 25, 50, 100, 150, 300hz. Enough to entertain you for centuries. Warning, highest frequencies considerably slow down the software. 50Hz is generally used. Warning ! Modifying the REP FRQ also changes all speeds of the songs ! The player was first intended to balance speed in consequence, but some people argued about that, because it wouldn't have allowed unusual speeds. OCTAVE = ...Octave. Used when playing a sound, or entering a note in a track. FREEMEM = Free memory. STarKos manages memory dynamically and optimizes data as much as possible. When this value equals 0, then the screen becomes red and the last action is cancelled. It's greatly advisable NEVER to save your song if this happen. Let's now have a look at 'DISC' and 'MISC'. This menu allows you to load/save your song/instruments. Note : All files generated with STarKos are saved in ASCII format. Disc accesses are therefore slower, but it's a necessity, as the data aren't written linearly in the memory. It brings a second problem : the AMSDOS errors managment of such file is a bit limited ; it doesn't allow an accurate detection of what error can happen while loading/saving. However, when an error occurs, it's possible to RETRY or CANCEL. - GETDIR : reads the disc directory, and gives back the remaining kilobytes, as well as the numbers of SONGS/INSTRS on the disc. Loading a file is disabled if there's nothing to load, which is logical. - DRIVE A/B : Allows you to switch between your drives, if you're lucky enough to have two of course. - LOAD SONG : Load a song, chosen in a little list. WARNING ! When the loading begins, the previous song in memory is erased ! - SAVE SONG : Save your song. The filename corresponds to the SONGNAME given in the PATTERNS LINKER page. - LOAD INST : Load an instrument. Once in memory, you must choose where to put it among the 255 slots. Note that a badly loaded instrument is automatically erased in memory. - SAVE INST : Save a selected instrument. The filename is the instrument name. - ERASE : Erase a file to select in a list. White filenames are the ones created with STarKos, for you not to erase a wrong file. A little remark : a loaded music is already completely optimized, so it's useless to optimize it once loaded. Press ESC to quit this menu. This menu has various options, about the software and your song. OPTIMIZE = Optimize the song. If you feel a bit cramped, try this. Warning, as all the data is crushed, the software might slow down a bit. OPT LEV = Optimization Level. MAX = as soon as a pattern/instrument is created or modified, only the needed room is allocated. This state saves every possible byte of memory, but slows down the software, proportionnally to the song size. NORMAL = When a pattern/instrument becomes smaller, the memory is not reorganised. This mode should be enough for 99.99% of the musics. CLEAR = Clear the Patterns, or the Instruments, or both ! WARNING, this can't be undone, so be careful ! AUTHOR = Allows to sign your music. Saved in the SKS file, but not in the generated file ! COMMENTS = Alows to write a little commentary of 32 characters. Save remark as above. ABOUT = Display some info about STarKos and his author (me !). samples according to its author's will. Press ESC to get out of this menu. Here's the first really interesting part of this notice. You're here to create your instruments. The upper-left menu allows you to copy or destroy any instrument. A STarKos instrument is built on a values list, of 256 lines max strong. These values are detailed just below. Know that you've 2 possiblity to create your sounds. The first one, the most complex but also the most powerful, consists in using the list of lines. The second one is graphical, like in the BSC's sountrakker. You can flip from one to the the other by pressing ENTER. NO INSTR : Number of the current instrument, the one that's being edited. INSTR END : Instrument height. Corresponds in fact to the last line used. INSTR LOOP : Number of the line where the instrument is going to loop when having reached its end. INSTR LOOP <= INSTR END. LOOP? : Boolean telling whether the sound must loop or not. INSTR LOOP is useless if LOOP?=0. A sound that doesn't loop doesn't make any sound at the end. RETRIG? : A tiny but useful boolean that, when set to 1, resets the Register 13 of the PSG at the beginning of the sound, so that you don't have to create a line especially for that. SPEED : Defines the time (a multiple of the Replay Frequency) between playing two lines of the instrument. '0' means that a line is played every 50Hz (if your Replay Frequency is 50), 1 = each 100Hz... Very useful to play slow and long sounds without having to copy the lines several times. Save both time and memory. CLIPBOARD : You can't access it directly. The value indicates where is the pointer inside the clipboard. It allows to copy lines of instruments in memory, to paste them elsewhere later. By pressing TAB, you go inside the instrument edition itself. The cursor managment works exactly as in the PATTERNS LINKER. RETURN/SPACE to define END/LOOP. Control+SPACE to switch LOOP?. Note that when defining LOOP, LOOP? is automatically set to 1. SND = Tell to the PSG to create a sound wave if set to 1. Set to 0, you can't create any melody with conventional sounds. But you can still create HARD envelope and add NOISE. VOL = Gives the volume, from 0 to &F. The volume is cancelled if a HARD sound is triggered. Likewise, a non-HARD sound with a volume to 0 cancels all the line, as nothing can be heard. NOISE = White noise value, from 0 to &1F. Mainly used for drums, percussions and explosions. Not linked to SND, but needs a volume greater than 0, or a HARD sound. ARP = Arpeggio. A signed value (from -#5F to #F added to the basic noise (given by your tracks, or your keyboard). Type 0,3,7 on 3 lines to get a minor chord. HARD = Tells if a HARD enveloppe is used. 0 if no, 1,2,3 or 4 if yes. 1 corresponds to a sawtooth curve, 3 to its symmetry. 2 to a 'montain' curve, 4 to its symmetry. Don't forget that the PSG can only manage one hard envelope, so giving a hard sound to more than one track at the same time generally results in harsch sounds (but some of you may find something interesting out of that for sure). SOUND FRQ = Sound Frequency. In AUTO mode (value =0), the sound frequency depends on the key played by your track or your keyboard. By giving a value (from 1 to #FFF), you force the frequency on your own initiative. This can be used to create special effects or to add effect/drums before the rest of the sound. HARD FRQ = Same thing, but for the HARD envelope (1-#FFFF). Note that if the AUTO (=0) mode is no more used, SHIFT becomes useless and is cancelled. FREQ (in Auto mode or not). Follow this nice equation : HARD FRQ = SND FRQ/(2 to the power of 'SHIFT'). Value from 0 to 7. Generally used : 4 or 5 for cool basses. INITWAVE = Allows to force the Register 13 to 1. When this happens, the HARD envelope is restarted from the beginning. Warning, setting a INITWAVE=1 in a loop produces a very disgracious sound. the HARD freq. No more desync ! The problem is, the approximation applies this time to BOTH curves, which produces some off-key notes. This effect is really only useful with low sounds, highest being completely wrong so much the frequency are truncated. FINETUNE = When HARDSYNC is activated, so is FINETUNE. Allows to generate a shift between the SOUND FREQ and the HARD FREQ. Now you can precisely master your 'mwwwaiiii', how lucky you are :). Value between (0 and &FF). As you can notice, the 'NO POS' column has white (only one when the instrument is empty) and blue values. Only the white ones are included to the interval of the sound to play. To enlarge this interval, increase the END parameter. Insert/Delete functions exist, through F0 and '.'. They apply on an entire line. But it's also possible to insert/delete a value in a single column only, but pressing CONTROL with F0 and '.'. Be careful, this function doesn't take all the instrument in account, but only the interval defined by your cursor and the END of the instrument, contrary to the 'raw' insertion that shifts everything from the cursor. WARNING ! As soon as you leave an instrument (by changing to another page or instrument), this one is automatically optimized in memory ! This means that some values will be modified all by themselves, and that the lines not included in the playing interval will be destroyed. p>As I said above, there's a second sound editor, graphical but less powerful. It will however be useful to quickly create simple sounds composed of volume and noise curves. Press ENTER to switch between the 2 editors. Oh, how beautiful it is ! By pressing TAB, you switch between the 2 graphics. The first one concerns the volume, the second the noise. - Light blue : This column is going to be played, no problem. - Dark blue : This column won't be played, because it's beyond the END limit. - Halftone : Won't be played because whether the SND doesn't equal 1 (so the volume has no incidence on the sound), whether HARD is set to 1, which cancel all volume anyway. To clear this halftone, check these two flags with the 'line' editor (another way, very simple, see below). - No halftone : No probleme, there's no HARD flag, so the column is going to be played, unless it's dark blue. For simplicity's sake, as soon as you modify a column, SND is automatically set to 1 (only if HARD=0), so you don't need the 'line' editor to create simple sounds. Warning : halftone/dark blue columns will be eliminated when optimizing, because they're of no consequence in the sound ! An advice : Use keyboard shortcuts to set END, LOOPTO and LOOP? without having to go to the upper-right menu. To finish, note that it's possible to insert columns with F0 and '. ', but that corresponds to a column-insertion in the line editor ! Thus, only the volume/noise curves are shifted. As before, only the interval defined by your cursor and END is shifted. Now you've got a wonderful sound, let's learn how to play it ! It is possible to play the current sound in each top-left menu of the main pages. To do this, you just have to use your keyboard, exactly like in the BSC's Sountrakker. It's also possible to play the current sound in the lower part of the instrument editor, by using the keyboard while pressing CONTROL. Warning, changes made on the sound data while playing it DOESN'T apply on what it heard ! You have to retrigger it to hear the changes. PLAYPATT to play the current pattern. PLAYSONG to play the song from the current position. Note that if you play your song from the position 0, SPEED takes the value of BEG SPD, which is logical. KEY : key and octave to play. Example : C-1, D#4. INSTR : Instrument to play, from 1 to #ff. Always go with the KEY. PITCH : Allows to make portamentos up/down. The value is signed, from -#7F to #7F. INSTR and KEY are linked : you can't have one without the other. VOLUME is always associated with a KEY, however you can put it where's there's no note. PITCH is completely independent, you can put it where you want, KEY or not. You can place a 'RST', a reset, by pressing CLR. This RST cuts the sound of the canal. Warning, what remains on the line will be erased when saving the track in memory. You can also put your digidrums in 'normal' tracks by pressing |. The number of the sample is defined by the current instrument, from 1 to &1f. Warning, the rest of the line will be ignored. The special track allows you to set Speed change, and to put Digidrums (for the moment, these one aren't played). Just put a S for Speed or D for Digidrum, followed by the value you want. Note that a little raster in at the bottom of the screen shows you when a digidrum starts IN THIS FRAME. So if you start more than one in a frame (by using a faster than 50hz song), you will still see one raster only ! of the channel if recovered. - CYCLE allows you to go from an extremity of the pattern to the other when going beyond. The '\' keys switch the switch, and a little logo shows if it's on or off. - BEYOND, switched by SHIFT + '\', allows to see what's 'beyond' the limit of the pattern. Know that if your pattern is #7f height, and that you bring it back to #1f, what's now hidden is still in memory, and can be seen by activating the BEYOND switch. When on, the NO LINE becomes white, indicating that you're still in limit of the pattern as you defined it. If they're blue, then you're beyond the limit, and can reach the physical limit of the pattern, #7F. Let's talk about the clipboards. You've got 2 clipboards only for the pattern edition. They work exactly like the Soundtrakker's, with one option added. The first clipboard is used to save a whole track. Note that if you copy ('copy' in the copy/cut/paste sense) a TRACK, you won't be able to paste it into a SPECIAL TRACK, and the opposite. Something new : if you use CONTROL instead of SHIFT while pasting, you'll paste notes only, and not emptiness ! So it's like a OR paste mode. Very useful to mix two tracks into one. The second clipboard allows you to take notes from a track, one by one, to stack them up in memory and paste them one by one where you want. It's important to notice that if you stack up notes from a track, you won't be able to stack anything from a special track. You'll have to reset the clipboard (Shift+0), and insert something from a special track. The contrary is true too. What's more, coming back at the begining of the clipboard sets a limit at the last item put in the clipboard recently. This limit can be redefined by copying others notes inside the clipboard. Ok, I think we've talked about everything. Wasn't it great ? Here it is, I guess that's all. Here's my advice : PRINT THE 'KEYS' file on this disk, it's very useful and has many keys to functions I coded to make STarKos powerful and nice to use. - Contrary to what most people think, it is NOT possible to convert ALL the ST musics to CPC, even if they use conventional sounds. The ST PSG runs at 2mhz, against 1 for the CPC. So, in order get the same sound frequency, you must divide all periods by 2. From this can come an approximation, or a desynchronisation between the normal and hardware soundwaves. That heppens in the MEGADIST song included in this kit. As suggested Madram, you could correct that by doubling the sound frequency (50hz-->100hz) and 'surrounding' the desired values with the 2 nearest values, and switching between them. Good luck. - STarKos is slower than most trackers, that's because the organisation is far more complex. I allow 255 instruments, 512 tracks, 256 patterns and special tracks... It's more than any trackers on CPC or ST. If I had managed my memory like BSC and PRODATRON did, I would never had enough memory. Everything is allocated dynamically. It's quite complex to manage and takes a bit of machine time. - The pattern display is slow. That's not because the code is not optimized, but because I used the tools I already had ; they're quite powerful, honestly fast, but that's not enough for such display. I needed pecialized routs. - But I can't afford that for the moment : I don't have enough memory ! STarKos is 24000 lines long, for 30KB max of compiled code ! - And last but not least : I MADE STARKOS FOR THE CPC SCENE, SO TELL ME WHAT YOU THINK ABOUT IT !!! Ok, that's all, folks ! See you soon !